Preheat oven to 425° F. Unroll the pie crust and use a cookie cutter to cut out three 1/2 inch circles in the crusts. Each crust should yield six circles. 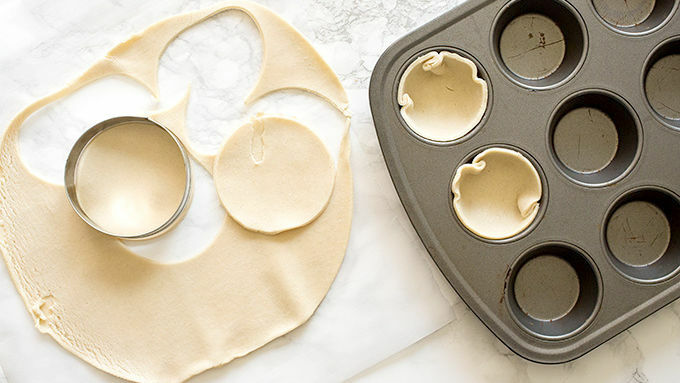 Press dough into muffin tins. Dump the pie filling onto a cutting board and give it a rough chop to make the pieces bite sized. Add to a mixing bowl. Place Snickers™ on the cutting board and cut each one in half. Add Snickers™ to pie filling and stir to combine. Fill each crust with the pie filling. Bake for 12 minutes or until crust is golden. 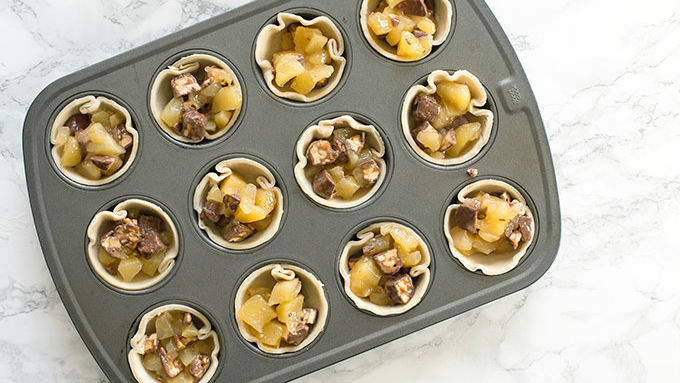 Remove from oven and cool 5 minutes before using a butter knife to gently lift the pie crusts from the muffin tin. Top with ice cream, whipped cream, or caramel sauce for a fun twist! We all know that there is nothing as American as apple pie, but what if we Americanized it just a bit more? You know, just for fun. Because we can. Because we should. Because America wants us to, you guys. 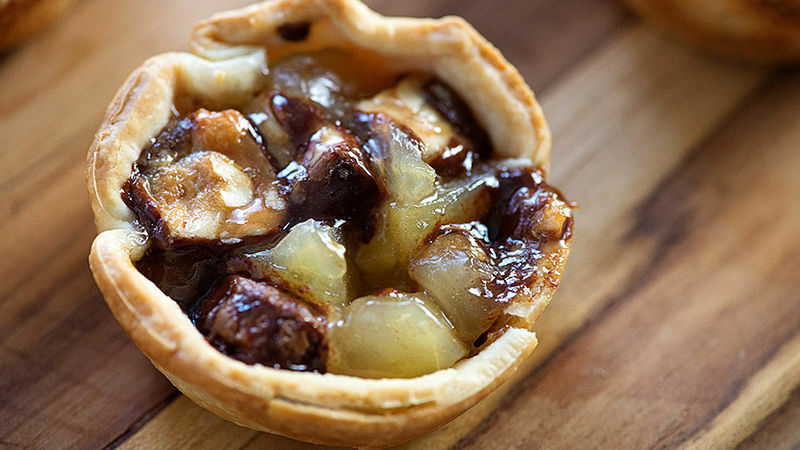 We’re going to make our pie handheld, so that we can eat it on the go. Because everyone needs pie on the go. We’re also going to add candy bars to our pie. I mean, do I even need to explain myself for this one? I didn’t think so. And, of course, we’re going to make this a three-ingredient recipe, because ain’t nobody got time for complicated recipes this summer. Much more important to spend our time noshing on apple pie cups while laying around the pool soaking up the sun. Let’s do this. 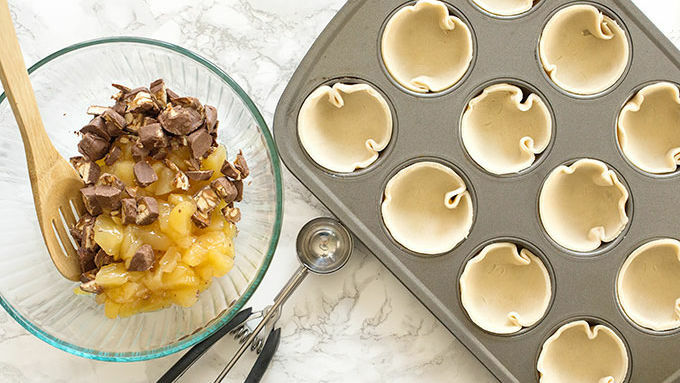 You need pie crust, apple pie filling, and Snickers bite-sized candy bars. 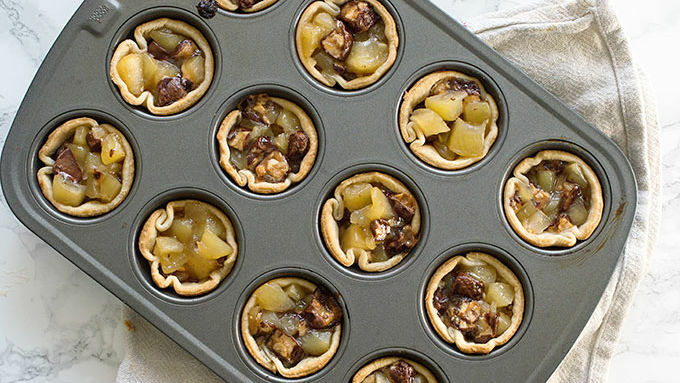 You’re also going to want a muffin tin. And, if you’re feeling fancy, grab a jar of caramel sauce for drizzling over the finished pies. Oh, and maybe consider topping these with some ice cream or whipped cream? Just for funsies.